Top Quality Regent Black Leather Riding Boots. Regent Boot Style no. 5602N. Width of calf = 36 cms (Approx. Leather Upper - Man Made Rubber Sole (excellent for grip). In Good Used Condition, so no need to suffer through breaking them in! ). Italian made from the softest calfskin leather in Italy which mould easily to the shape of the leg. Height 45.5cm / 36.3cm Calf Width. Black Grainy Quick Leather. 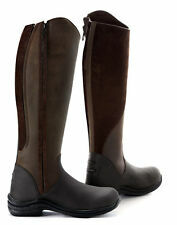 "Made in Germany, the Konigs Favorit Dressage Boot has an elegant look with a high dressage cut. This classic dressage boot has a full length zipper, square-shaped leather heel cap and a rubber sole and heel". Circumference of calf (widest part): 36cm. 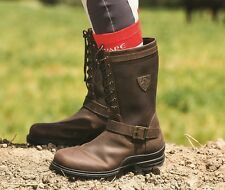 Smart long riding boots. Circumference of top of boot: 34cm. Black leather pull on boots. Outer leg height (from above the sole): 51cm. Inner leg height (from above the sole): 46cm. New original box, black tall horse riding boots, full zip at back, size 40.